Place all ingredients into a plastic bag, and gently shake until the zucchini is coated in the oil and spices. 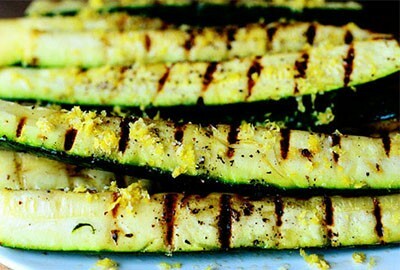 When the zucchini is cooked to your liking, remove from the grill and allow to cool. These retain A LOT of heat. So cooling time is essential. NOTE: For crispier/crunchier zucchini, cook on higher heat for a shorter time. For a softer zucchini, cook on lower heat for a longer time. Top with lemon zest for an extra zesty taste! !